THREE THINGS TO DO IN LOGAN COUNTY THIS WEEKEND! Sterling High School will present Bye Bye Birdie in three performances, Thurs-Fri-Sat, March 22-23-24 in the SHS Frank Hunter Theater. Doors open at 6:30 pm, with curtains at 7 pm. songwriter Albert Peterson, whose song Birdie was just about to record. Albert's longtime girlfriend Rosie pushes Albert to write a new tune that Birdie will perform on television to a fan selected in a contest. The scheme works, with young Ohio teenager Kim McAfee declared the winner, but no one has counted on the jealous wrath of her boyfriend. Tickets are $7 and are available at the door. Northeastern Junior College presents Cartoon in two performances on Fri., March 23 and Sat., March 24 at Corsberg Theater on the college campus. Doors open at 6:30 pm; show starts at 7 pm. "Toon Town Ain't What It Used To Be," in this student directed play. Due to some depictions of violence and adult themes, viewer discretion is advised. By Steve Yockey, the production is co-directed by Howie Jordan and Karma Contreras. Cost is $5 per person, and NJC students, faculty and staff can enjoy the production for free. Pick up a self-guided map at the Logan County Visitor Center (or get one here) and take a leasurely tour of the Bradford Rhea Tree Sculptures. 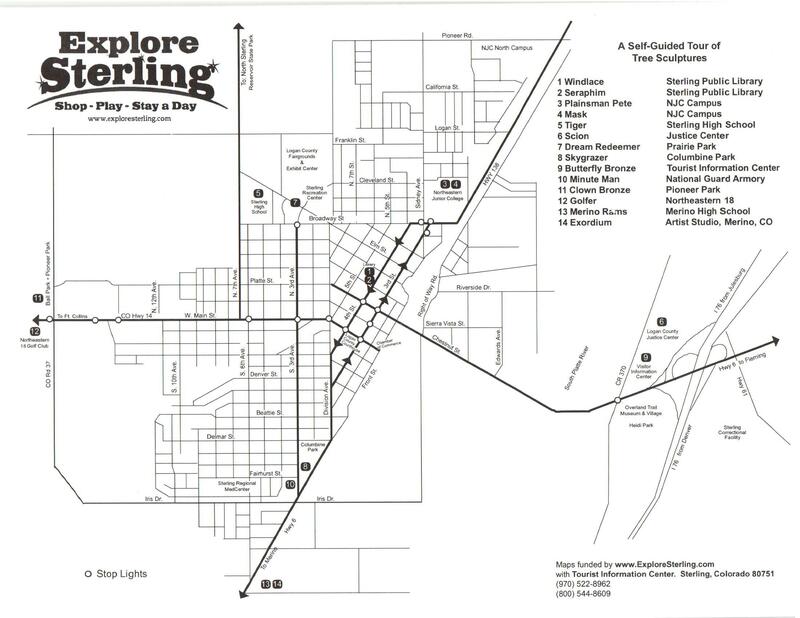 Sterling is known as the City of Living Trees for its collection of cottonwoods that have been carved into fanciful creatures and inspiring characters by Rhea. Some of the sculptures have now been restored and cast in bronze and several have been moved inside. Make your way around Sterling and enjoy the exquisite details of these one-of-a-kind pieces of art. Click here for more information.